Custom Dice Stickers are half inch square stickers that are used in conjunction with our indented blank dice. 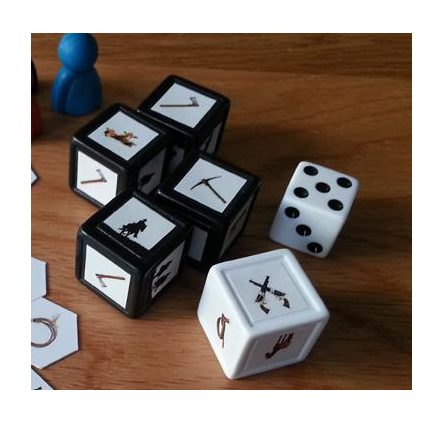 This allows game designers to create their own custom printed dice. Custom Dice Sticker image files should be 188x188 pixels. It is generally a good idea to bleed your background color over the entire square image (past the red line, all the way to the edges of the image so that there is no gray visible). In addition, even minor print/cut registration problems will be very apparent because the sticker is so small, so simple images are better, and be sure to keep the important parts of the image inside the blue safe zone line. Custom Dice stickers come 270 to a sheet and are designed to fit on our indented blank dice. When you purchase stickers you're purchasing the whole page even if you only need 1, so keep that in mind when designing your game. Keep in mind that there are 6 sides to each die, so you'll need six stickers per die. It is also a good idea to include extra stickers in case players damage one while applying them to the dice. You must indicate the quantity you want to have printed for each sticker or you'll receive only one of each.